(Newser) – If the Syrian regime falls, the US plans to deploy troops to stop its chemical weapons from becoming a first-come, first-served bonanza for insurgent groups, senior officials say. Plans are in place to secure the sites if necessary, a move that would probably involve teams of special forces operatives entering the country to guard sites as well as precision airstrikes to incinerate other locations without releasing poisons into the air, the Los Angeles Times reports. The Pentagon fears that stockpiles left unguarded could fall into the hands of rebels linked to al-Qaeda or other Islamic extremists. what a damn shame! do syria a very big favor for all of the people! make them into a parking lot and let them start over again in peace! end of story! a bigger shame is that they got a lot of the chem weaps from the good old usa! HAMDAN (SANA) - Minister: Creating Crisis in Syria Is Part of the Scenarios to Cover Israel's Crimes Iranian Interior Minister, Mostafa Mohammad Najjar, said creating crisis and tension in Syria is one of the scenarios of the leaders of the hegemony powers that are aimed to provide cover for the crimes of the Zionist entity in the region. In a speech on Tuesday in the province of Hamdan, in western Iran, Najjar added that the world's hegemonic powers are seeking through this scheme to divert public opinion attention away from the Zionist entity's brutal crimes and direct it towards Syria. He warned that what is happening in Syria comes in the context of plots prepared in advance by the leaders of world hegemony to spread discord among the ranks of the Islamic Nation. Iran's Interior Minister said the opening and use by these powers of hundreds of satellite channels and radio stations and the allocation of huge budgets for media and for sending arms into Syria is aimed at making what the Zionist entity is doing look as if it is among the less important issues in the region. Boroujerdi: US Project of Targeting Syria Suffered New Defeat in the Region Chairman of the National Security and Foreign Policy Committee at Iran's Shura Council, Alaeddin Boroujerdi, considered that the American project targeting Syria has recorded a new defeat for the US. In a statement to the Iranian IRNA news agency on Tuesday, Boroujerdi said Washington seeks to change the political structure in Syria through creating crisis in it with the aim of consolidating its capabilities after losing its bases in Iraq and Egypt. He highlighted how Washington has sought, by making use of the capabilities of the European countries and the Zionist entity and with the encouragement of some Arab countries in the region such as Saudi Arabia and Qatar, to inflame the situation in Syria and target it. 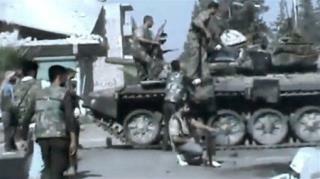 The Iranian official however stressed that the US's project against Syria suffered another defeat in the region. MOSCOW (RT) - Russian Foreign Ministry: The West is Inciting Syrian Opposition to Continue Fighting The Russian Foreign Ministry said that the West is unequivocally inciting the Syrian opposition to continue fighting. RT website quoted the ministry as saying in a statement on Wednesday "Our Western partners have done nothing so far to pressure the Syrian opposition to start dialogue with the government, otherwise they are clearly inciting it to continue fighting, which will undoubtedly lead to no political solution to the crisis." "The Russian government knows what ought to be done, as all the members of the work group on Syria vowed in their final statement in Geneva to work with the Syrian government and opposition to launch the national reconciliation process as soon as possible," added the statement. The statement said Moscow proposed adopting a concise statement on behalf of the work group on Syria that calls upon the Syrian government and opposition to end the violence as soon as possible and appoint negotiators to start a political dialogue. "But our Western partners showed total opposition even to the idea of discussing the possibility of this statement, trying instead to distort the content of Geneva agreements, in addition to leveling accusations at Russia of foiling the efforts of the UN Security Council to find a solution to the crisis in Syria... This stance is sheer hypocrisy. It is well-known that Russia is shouldering its responsibility, and is working with the Syrian government and opposition to halt violence and launch dialogue as soon as possible to solve the crisis,'' said the statement," said the statement, which added that Moscow received a Syrian official delegation who renewed their readiness for a political dialogue with the opposition. The Russian Foreign Ministry's statement came in response to the statement of the spokeswoman for the US Department of State Victoria Noland which stated that the Russian government knows what ought to be done to solve the crisis in Syria. Russian Military Expert: US Responsible for Victims in Syria Director of the Russian Center for Analyzing World Arms Trade, Igor Korotchenko said that the US is responsible for the victims and suffering in Syria, as it has supported the opposition and armed groups there and rejects a solution to the crisis. In an interview with Russia Today TV on Wednesday, Korotchenko said there are confirmed reports that the US President Barack Obama signed a memo that allows the US forces to support the opposition and armed groups in Syria, which proves the US does not want a solution to the crisis. He indicated that al-Qaeda organization is fighting alongside the armed opposition in Syria, adding that the goals of the US and al-Qaeda are the same at this stage. Korotchenko stressed that the priority now is to dialogue and work to end violence, adding that the Russian position is clear unlike the stances of Western countries which are trying to supply the opposition with weapons.